With stout heart, a young hero snatches up a hapless turtle at the midpoint of a dangerous journey across the road. Carefully, he carries him to the safety of the nearby creek. Then, patiently, he waits, until a curious head emerges from the safety of its shell. At last, in a close encounter of the friendly kind, turtle and boy meet Face to Face! 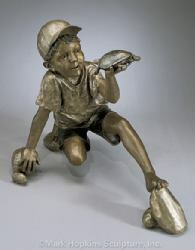 This piece is a lifesize monument bronze. Looks great in a business entry or home back yard! We currently showcase this piece in our Steamboat Springs Gallery. Flexible Payment Options May Be Available. Call (970) 870-7976 for additional information.